Tomorrow I will find myself immersed in a memorial observance of my Spiritual Teacher’s final day on Earth one decade ago, October 11, 2007. Every year since Sri Chinmoy passed away, his disciples gather for pilgrimage and tribute on this anniversary at Aspiration-Ground in Queens, New York. Yesterday a free Peace Concert was held at All Souls Church in Manhattan. It featured excerpts from Peace Concerts given by Sri Chinmoy across the globe interspersed with live a cappella performances of his songs with a peace theme. The concert also featured slides of his artwork as a backdrop for the singers. The final performance footage showed Sri Chinmoy playing piano with thunderous majesty and dynamism. Today a 2 mile race was held in Flushing Meadows Corona Park. The Sri Chinmoy Marathon Official Website describes the history behind this inspiring race held in a beautiful section of the park. The Sri Chinmoy Heart-Garden was dedicated by the New York City Department of Parks and Recreation in honour of Sri Chinmoy, the renowned peace philosopher, author, composer, artist, humanitarian and athlete, on October 11, 2006. Exactly one year later Sri Chinmoy passed on leaving a vibrant legacy of world service and creativity in many fields. In celebration of his life, and his love of running, the international Sri Chinmoy Marathon Team inaugurated the Heart-Garden Two-Mile Race in his name in October 2009. It is now an annual event drawing participants from many countries. After the race, we made a soulful procession with the lit peace torch along the portion of the race course named after Sri Chinmoy in 2006. Honored guests spoke and as we sat in the glistening sun with the Sri Chinmoy Heart Garden behind us, I was moved to tears by the deeply moving words offered by local athletes, Olympians, coaches, politicians and ambassadors. It was a perfect morning shared by race participants from more than 20 countries. 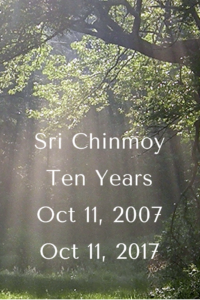 Tonight, October 10th, we will begin a vigil at midnight which lasts until midnight on the 11th with the chance to place a candle offering at the feet of the samadhi and the scent of jasmine garlands and the soulful meditative music of Sri Chinmoy will envelop us. Ten years ago it was hard to imagine life with our dear teacher departed from our earthly presence. Each year that passes it becomes easier because our inner connection continues on strong, stronger, strongest. Whether through dreams, inner messages or just the thrill of an endless journey to become ever closer to the ideals of Sri Chinmoy’s offerings reverberating in our hearts and in the world around us, I quote the final poem in a series published that foreshadowed this next chapter in his mission.